In the stormy fall of 2009, during the worst downturn since the Great Depression, 6,900 electrical contractors arrived at Seattle's convention center to find a brilliant September sun. The sun wasn't the only surprise. "It was a little crazy, considering the economy, but we did great," says Beth Ellis, the group's executive director for conventions. "We even had extra people register after we arrived. We exceeded our expectations." Seattle, although a tad out of the way, remains a premier convention and meeting destination. "For us East Coasters, it is a long flight, but when everybody gets there, they want to go back [again]," says Ellis, whose National Electrical Contractors Association is based in Maryland. "Meeting close to where they live doesn't entice them. But Seattle ... Seattle is a clean city, walkable, a very safe city that our members really enjoy." Even in hard times, the Washington State Convention & Trade Center shines. Year in and year out, it brings in tourists and convention-goers by the tens of thousands, and direct tax revenue to the state of about $26 million annually. "Convention centers typically are designed as loss leaders," says Kate Joncas, president of the Downtown Seattle Association. "This one actually makes money. It's one of only four around the country that turns a profit. We really listen closely to [convention center president] John Christison, because he does an excellent job operating it." Christison says he can't quite confirm that "one of only four" statement. "But it's true there are only a very limited number of centers that produce a profit at the operating line"-in Seattle, to the tune of $2.4 million for the fiscal year that ended June 30, 2009. That's cause for celebration. Besides making itself a profit, the center figures that since it opened, it has brought in $3.2 billion from out-of-state delegates, who paid $180 million in taxes to the state's general fund. The recession drove numbers down in 2009, just as Christison warned in his previous year's annual report. But, he adds, "I remain very optimistic about our long-term future, despite the effects of the current economy. This situation is remarkably similar to the one we faced following September 11. Once again, we are well-positioned to ride out this downturn." All well and good, but here's a catch. How did such a well-regarded center get so crosswise with the state Legislature last year that it wound up asking the governor to veto part of its budget, thus inspiring a lawsuit against the state? Spread over the top of Interstate 5 in downtown Seattle, the state Convention & Trade Center opened in 1988, doubled its exhibit space in 2001 (just prior to the Sept. 11 attacks) and is on track this year to open four additional floors of high-quality meeting and exhibition space connected to the existing center by a skybridge over Pike Street. That location, smack in the center of town, is one of the center's biggest draws. Its goal is to draw a particular type of business client here. "The convention center is specifically tailored to draw in very highly paid people from out of town," says Joncas. "They are very strategic in evaluating the attendees most likely to spend the most money-from engineering, medical, computer and technical fields." But the center does not have the acreage to draw the country's biggest conventions. "It's an interesting irony. Our center is small because it is downtown, yet it serves us well because of its fantastic location surrounded by restaurants, hotels, shows," says David Blandford, public relations director for Seattle's Convention & Visitor's Bureau, which markets the convention center. Before the 2001 expansion, the center was the 51st largest in North America. It briefly became the 28th biggest, but as other cities built up their competing centers, it's fallen today back to 68th. What Christison believes is the necessary next step for the center-and what the people who listen closely to him are pushing for hard-is to spend something in the neighborhood of $600 million to $700 million to double the center's size, even at a time when business is down and convention centers nationally are hurting in an industry that's almost certainly overbuilt. When the center asked the Legislature last year to OK the expansion, it heard more skepticism than support. "We were struggling with billions of dollars in deficits at the time," says state Sen. Rodney Tom, D-Bellevue and vice-chairman of the Senate Ways and Means Committee. "It's hard for us to complain about revenue if we keep giving it away." The convention center, which is funded almost entirely by a hotel tax in Seattle, planned to use its own money for the expansion-not money from the state's general fund, and the hotel tax wouldn't need increasing-but needed the Legislature's approval to make the investment. "What we heard was this is a bad time for the state to be making a major investment like this, when we have a $9 billion state shortfall," Christison says ruefully. In fact, for the second year in a row, the Legislature instead purloined millions from the center's surplus funds-$65 million in fiscal 2008 and another $22 million in 2009-to help balance the state budget. The argument against expanding the center goes like this: Other, bigger convention centers nationally are already hurting. Even the proposed expansion here won't make it competitive with megacenters like those in Denver and San Francisco, which boast something upward of 900,000 square feet of space. Our state convention center is already a success. Why, during a recession, spend more when it still won't be big enough to play with the big boys? Because, Christison says, we'd be better positioned for the majority of conventions. "If you think about the industry as a triangle, the pointy part at the top is the largest exhibits that really need huge centers of a million-plus square feet. We're not there and we won't be. We don't want to be competing with Chicago or Atlanta. We want to be in the 'sweet spot,' where the majority of the business resides." The state Convention Center this year will have something under 400,000 square feet of exhibit and meeting space. Even some "local" companies have outgrown that. "We have home-grown, fabulous international companies-Microsoft, Starbucks-and we're no longer big enough to hold their international conventions," says Joncas. Indeed, Microsoft now has its company-wide annual meetings at nearby Safeco Field, home of the Seattle Mariners. But the real problem for the state convention center is not that it's out of space. What it's really out of is time. That part about Seattle being a desirable city? That's so true that the convention center runs out of desirable dates. "All our prime dates are booked up solid," says Christison. This is the crux of the argument-what Joncas calls the "load in, load out" factor. A convention not only takes up its "official" days, it also fills the facility while it's moving in and moving out. "The first three or so days are getting the convention and its exhibits set up. Then you have the three days while the delegates are actually in town and the show occurs. And then you'll spend two days taking it all down again," Christison explains. The prime reason the state convention center exists is to rope those delegates in to spend out-of-town money with our in-town restaurants, hotels, shops and shows. The "load in, load out" days are dead days from that economic perspective. Christison's expansion plans aren't primarily to lure bigger conventions here, but to get more days out of the year by building a second center kitty-corner from the existing one, on top of the existing downtown bus tunnel's Convention Place stop. "If we build a sister venue to the one we have now, about the same size, we could have one in 'show' mode while the other is moving a convention in or out. We could shuffle back and forth between the two to get maximum yield for the available days-more bang for the buck." A sister center could also combine with the current one to create enough space to keep those "fabulous" local companies here. "Microsoft has told us in no uncertain terms that they would be thrilled if we grew because it would make their lives a lot easier," Christison says. He's under no illusion that doubling the center's space would double its return. "But it may well increase it by two-thirds. And that's a great return on the investment. That's the philosophy behind this. It's not really a space race. We're not arguing the fact that some cities have made bad decisions in overbuilding their convention centers. But if you are a city like Seattle that has strong destination appeal, you're going to do well. We have pent-up demand-we don't have enough dates available to deal with that demand." Christison thinks the center can prove that-to the Legislature and anybody else necessary-in two ways. One is a "lost business" study from the Convention & Visitor's Bureau that shows $1.7 billion in missed revenue since 2004 because the center was already booked or just too small. The other is through a feasibility study delivered last February that "unequivocally confirmed the attractiveness of Seattle as a convention destination" and said the expansion would be heavily used, bringing 124,608 new visitors and 31 new out-of-town conventions annually here by 2018, for a direct economic impact of $225 million that year. The report, by San Francisco-based Economics Research Associates, adds: "A significant portion of the spending flows into the hotel sector of the economy, and the hotel tax collections in downtown Seattle should total over $8 million per year in stable operations." Hotels are the other key to the convention business. Conventions need "big box" hotels, not boutique inns. Conventions lust after rooms in large blocks, preferably spread among as few hotels as possible located as close as possible to the convention center. In Seattle, the Sheraton-the city's largest-added a second tower in 2007 to total 1,258 rooms. Together with the Westin, the Renaissance and the Grand Hyatt, the city can offer more than 3,000 "big box" rooms to convention-goers. It won't be enough if the convention center expands, however. "We'd probably be a little light in terms of hotel rooms," Christison says. "But at least one new 1,200-room convention hotel is being planned a few blocks away by R.C. Hedreen Co. That and the Sheraton would bookend the center nicely." David Thyer, president of R.C. Hedreen, confirms that his company-which has been building hotels here for decades-plans to develop the current site of the Greyhound bus station. "We're hoping we can do it in the same time frame as the expansion of the convention center," Thyer says. "Obviously, it would be tough in the existing market to put up something of that scale." Like other downtown business leaders, Thyer is puzzled by the last year's standoff with the Legislature, which ended with the state raiding the convention center funds while telling the center to redo its feasibility study on expansion. The center's board asked Gov. Chris Gregoire to veto that requirement. "The language wasn't terribly clear, and there wasn't an appropriation to cover the cost of redoing the study," says Christison. Gregoire didn't veto that piece (and the center expects to have the revised study in hand for this year's legislative session), but she did veto the $22 million draw from the center's funds, which also became the target of a lawsuit by a group of hotels, which argue the draw is unconstitutional. Meanwhile, the Legislature, which remains in desperate need of money, is also considering revoking a 2 percent tax credit it granted the convention center over the last expansion. "It looks like at this point the convention center is a pretty self-sustaining business," says Sen. Tom. "Going forward, we want them to stand on their own." Overall, though, Tom says he believes the convention center and the Legislature will come to an agreement this year. "We're having very friendly conversations to work toward a mutually beneficial outcome. 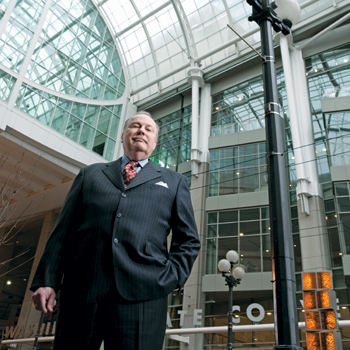 Obviously, the convention business is very important to our region, and downtown Seattle is a great place to come." So let's keep it that way and get moving on a bigger convention center, says Joncas at the Downtown Association. "We have the money. This is a time when we need jobs. We need economic stimulation. Why doesn't the Legislature let us go ahead?" she asks. "To turn down construction and jobs in times like these, it's hard to believe. With this coming legislative session we're being given a second chance to get it right."